Hello Maugansville. 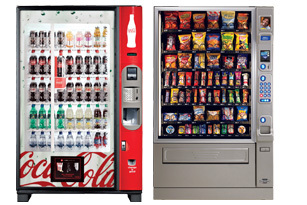 Hagerstown Canteen Service is your office coffee and full service vending solution. Let's get your workday started right and improve the attitudes of your employees with the addition of vending machines and office coffee services. We're ready to supply the foods and beverages your employees need to stay focused in their jobs. We pride ourselves on providing excellent name brand products and exceptional customer service in Maugansville and surrounding areas. Fully stocked and organized break room shelves.